2008 Port and Island Openings See the pictures of Opening of the Port and Opening of the Island. Boating in Michigan: DNR http://www.michigan.gov.dnr/ (Click on "Recreation and Camping", then "Boating"
U.S.C.G. "Think Twice with Ice" brochure. Posted January 24, 2018 Toledo Sail and Power Squadron Safe Boating Classes for 2018. See the flyer. Sail Events and information are posted on the "Sail Activities" page. Posted 5/22/2018 Perrysburg Boat Club Brick fundraiser. See the flyer. Posted 8/4/2018 Toledo Yacht Club Toledo Yacht Club is proud to announce that we have a new restaurant opening Friday, Aug 3rd. Friday’s only from 5:30pm – 8 pm through August, then starting in September, every Friday and Saturday night from 5:30 – 8pm. Open to all AYC members and located on the main dining floor. Posted 12/16/2018 Detroit Beach Boat Club Friday Night Euchre BEGINNING January 11, 2019. See the flyer. 4/20/2019 Great Lakes Steel Boat Club 2020 Commodore's Fundraiser: Walleye Tournament. See the flyer. 4/20/2019 Harbor View Yacht Club Mad Dog. See the flyer. 4/24/2019 Monroe Boat Club Fish Fry. See the flyer. 4/26/2019 Wyandotte Yacht Club Ladies Shopping Emporium. See the flyer. 4/27/2019 Cooley Canal Yacht Club 17th Annual Wild Game Dinner. 4PM until ?? $25 donation. Advance purchase recommended. 4/27/2019 River View Yacht Club 30th Jet Express Cruise to Put-In-Bay. $60 per person. Tickets available at RVYC. Advance purchase recommended. 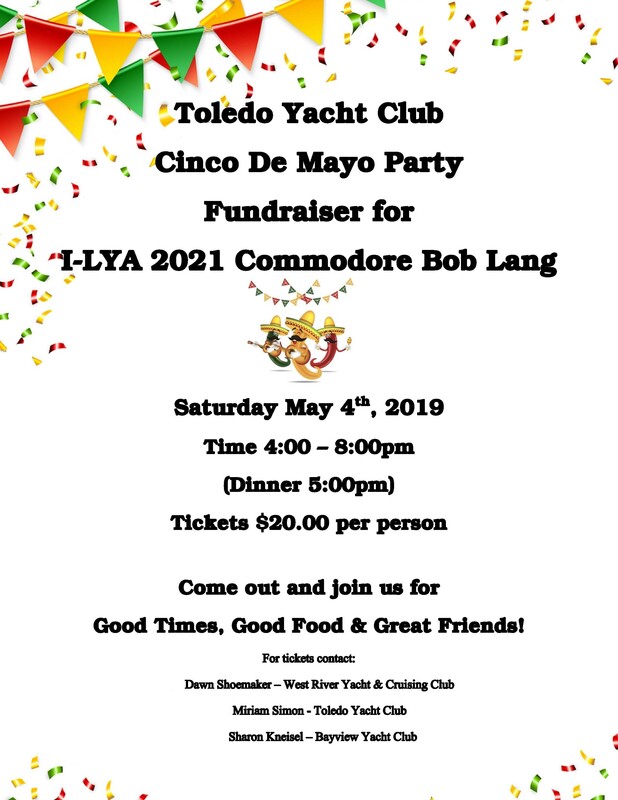 5/4/2019 Toledo Yacht Club TYC hosts a 2021 I-LYA Commodore's Fundraiser: Cinco de Mayo. See the flyer. 5/4/2019 Nugent's Canal Yacht Club Derby Party. See the flyer. 5/4/2019 Grosse Ile Yacht Club GIYC PC Auction starting at 6PM. See the flyer. 5/10/2019 Swan Boat Club Steak Roast. See the flyer. 5/12/2019 Swan Boat Club Mother's Day Brunch. See the flyer. 5/16/2019 Wyandotte Yacht Club No cook Thursdays Pasta Night. See the flyer. 5/17/2019 I-LYA Commodore Cindy Johnson - Mintus' Fundraising Dinner Cruise. See the flyer. 5/17/2019 Swan Boat Club Steak Roast. See the flyer. 5/18/2019 Cooley Canal Yacht Club Drag Queen Bingo. See the flyer. 5/27/2019 Swan Boat Club Steak Roast. See the flyer. 5/28/2019 Detroit Beach Boat Club Car Show. See the flyer. 5/28/2019 - 5/29/2019 Sunseeker's Boating Club Luau Regatta. 6/2/2019 AYC AYC Golf fundraiser for VC Stan Ziemkiewicz and Lady Cindy. 6/7/2019 - 6/9/2020 Opening of the Island Save the dates. 6/7/2019 Steak Roast. See the flyer. 6/13/2009 Great Lakes Steel Boat Club 2020 Commdore's Fundraiser: No Cook Thursday. See the flyer. 6/14/2019 Steak Roast. See the flyer. 6/20/2019 Wyandotte Yacht Club No cook Thursdays Taco Night. See the flyer. 6/21/2019 Swan Boat Club Steak Roast. See the flyer. 6/27/2019 Swan Boat Club Steak Roast. See the flyer. 6/28/2019 - 6/30/2019 Swan Boat Club Poker Run. See the flyer. 7/11/2019 - 7/13/2019 Elba Mar Boat Club Elba Mar Days. Commodore's Reception 7/12/2019. 7/11/2019 Great Lakes Steel Boat Club 2020 Commdore's Fundraiser: No Cook Thursday. See the flyer. 7/12/2019 Steak Roast. See the flyer. 7/18/2019 Wyandotte Yacht Club No cook Thursdays Burger Night. See the flyer. 7/19/2019 Swan Boat Club Steak Roast. See the flyer. 7/26/2019 Swan Boat Club Steak Roast. See the flyer. 7/26/2019 - 7/28/2019 Monroe Boat Club Regatta. Commodore's Reception 7/27 at 1619hrs. 7/27/2019 Nugent's Canal Yacht Club Commodore's Firearms Fundraiser Raffle. Randyu Rogers for tickets. 8/9/2019 Swan Boat Club Steak Roast. See the flyer. 8/15/2019 Wyandotte Yacht Club No cook Thursdays Greek Night. See the flyer. 8/16/2019 Swan Boat Club Steak Roast. See the flyer. 8/23/2019 Swan Boat Club Steak Roast. See the flyer. 9/6/2019 Swan Boat Club Steak Roast. See the flyer. 9/14/2019 Great Lakes Steel Boat Club 2020 Commdore's Fundraiser: No Cook Thursday MOVES to Saturday for a "Zukin's Dinner". See the flyer. 9/19/2019 Wyandotte Yacht Club No cook Thursdays Coney Night. See the flyer. 10/10/2009 Great Lakes Steel Boat Club 2020 Commdore's Fundraiser: No Cook Thursday. See the flyer. 3/14/2020 - 3/21/2020 AYC Vacation with the 2019 Class. See the flyer and registration form. NOTE: The date on the flyer IS correct! The date on the registration form is INCORRECT. 1/03/2019 Swan Boat Club Blood Drive. See the flyer. 1/05/2019 Detroit Beach Boat Club Bowling Fundraiser for AYC Room. See the flyer. 1/19/2019 Cooley Canal Yacht Club Lasagna Dinner. $10 per person. Start at 1PM. See the flyer. 1/19/2019 Detroit Beach Boat Club Turkey Fry. Fundraiser for AYC Room. See the flyer. 1/25/2019 AYC JP Tactics Wild Game Dinner, fundraiser for AYC VC Stan Ziemkiewicz and Lady Cindy. See the flyer. 1/27/2019 Cooley Canal Yacht Club Chicken Paprakash Dinner. $10 per person. Start at 1PM. See the flyer. 2/1/2019 - 2/2/2019 Ottawa River Yacht Club / Toledo Ice Yacht Club Winterfest & Ice Boat Regatta at ORYC. 2/2/2019 Maumee River Yacht Club Story Teller Dinner and Show. See the flyer. 2/3/2019 Swan Boat Club Superbowl Chili Cook-off. See the flyer. 2/9/2019 Toledo Yacht Club Euchre. See the flyer. 2/15/2019 - 2/17/2019 AYC AYC Commodore's Ball honoring Com Joe Petersberger and Lady Karen. Canyon Ridge band Friday night, Cliff Cody Saturday afternoon, and Reese Dailey Saturday night. See the flyer. 2/22/2019 Toledo Yacht Club Name That Tune. See the flyer. 2/23/2019 West River Yacht & Cruising Club Comedy night and Spaghetti Dinner. V/C Fundraiser for Commodore ball, Spaghetti Dinner/Comedy Night - tickets are $25 each (tickets will be available at door if not sold out) Contact P/C Dawn Shoemaker 734-347-2085 or V/C Keith Postma 519-981-8586 for tickets. CLASS CHALLENGE Wear your colors if you have them. See the flyer. 2/24/2019 Ford Yacht Club FYC PC's Spaghetti Dinner with Class Challenge. 2PM to 6PM or until sold out. Adults $12, Children $3, under 10 free. See the flyer. 3/1/2019 Detroit Beach Boat Club Ray Fogg Show. See the flyer. 3/2/2019 Nugent's Canal Yacht Club Gun Raffle and Prime Rib Dinner. See the flyer. 3/6/2019 AYC Fish Fry. Fundraiser for AYC VC Stan Ziemkiewicz and Lady Cindy. See the flyer. 3/8/2019 Swan Boat Club Fish Fry. See the flyer. 3/8/2019 Detroit Beach Boat Club Fish Fry. See the flyer. 3/9/2019 - 3/16/2019 AYC 2018 AYC Commodore's Cruise. $1380.05 per person. Deposit $250. Final payment due 10/9/2018. See the flyer. See the registration form. 3/9/2019 Detroit Beach Boat Club U.S.C.G.A. Safe Boating Course. See the flyer. 3/12/2019 River View Yacht Club Taco Tuesday. 5:30 to 7:30 or until gone. 3/15/2019 Detroit Beach Boat Club Fish Fry. See the flyer. 3/16/2019 Swan Boat Club St Patrick's Day Party. See the flyer. 3/16/2019 - 3/17/2019 Toledo Yacht Club St. Patty's Weekend. Entertainment. Jiggs Dinner. Drink specials. 419-283-4864 for reservations. 3/22/2019 Detroit Beach Boat Club Fish Fry. See the flyer. 3/22/2019 AYC AYC Bowling fundraiser for VC Stan Ziemkiewicz and Lady Cindy. 3/23/2019 Detroit Beach Boat Club Spring Fling Bingo. See the flyer. 3/24/2019 AYC Commodore/Vice Commodore Spaghetti Dinner, served by 2017 Class. Dinner at Detroit Beach Boat Club, at 1:00PM. 3/28/2019 Sun Parlour Boat Club Steak or Chicken Roast. 6PM. RSVP by 3/25/2019 to Commodore Neil Bastien. 3/29/2019 Detroit Beach Boat Club Fish Fry. See the flyer. 3/30/2019 Yellow Dogs Ottawa River Yacht Club hosts. 4/5/2019 Detroit Beach Boat Club Fish Fry. See the flyer. 4/6/2019 Toledo Yacht Club Back to the Bay Party. See the flyer. 4/7/2019 IOBG 25 Feather Bowling. $20 per person. Cadieux Cafe 5PM. Cancelled. 4/13/2019 National Boating Federation Meeting will be hosted at Ford Yacht Club. Start time 9AM. 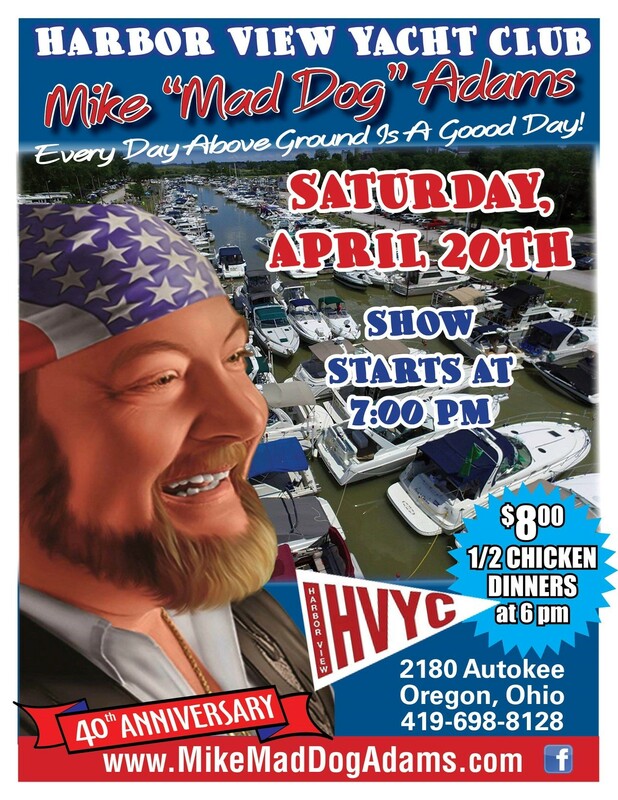 4/13/2019 Toledo Yacht Club Mad Dog Mike Adams. 7PM. Tickets $15 advance, $20 door. 4/13/2019 Maumee River Yacht Club Mediterranean Night. See the flyer. 4/14/2019 AYC Polish Dinner fundraiser for AYC VC Stan Ziemkiewicz and Lady Cindy. River View Yacht Club. See the flyer. 4/19/2019 Swan Boat Club Fish Fry. See the flyer. 4/19/2019 Detroit Beach Boat Club Fish Fry. See the flyer.